Autoclaved aerated concrete (AAC) is a type of precast concrete composed of natural raw materials. It was first developed in Sweden in the 1920s, when an architect first combined the conventional concrete mixture of cement, lime, water, and sand with a small amount of aluminum powder. The aluminum powder serves as an expansion agent that causes the concrete to rise, somewhat like bread dough. The result is a concrete that consists of almost 80 percent air. AAC concrete typically is made into blocks or slabs and is used to build mortared walls in a manner similar to that used for standard concrete block construction. Autoclaved aerated concrete begins with the same process used to mix all concrete: Portland cement, aggregate, and water are mixed together to form a slurry. Upon the introduction of aluminum as en expansion agent, air bubbles are introduced throughout the material, generating a low-density lightweight material. The wet concrete is molded into shapes using forms, then cut into slabs and blocks once partially dried. The units are then moved to an autoclave for full curing under heat and pressure, which takes only 8 to 12 hours. AAC concrete units are highly workable and can be cut and drilled with conventional woodworking tools, such as band saws and ordinary power drills. Because it is lightweight and relatively low-density, the concrete must be tested for compressive strengths, moisture content, bulk density, and shrinkage. AAC concrete can be used on walls, floor, roof panels, blocks, and lintels. Panels are available in thicknesses of between 8 inches to 12 inches and 24 inches in width, and lengths up to 20 feet. Blocks come in lengths of 24, 32, and 48 inches, and thicknesses of 4 to 16 inches; height is 8 inches. Cured blocks or panels of autoclaved aerated concrete are joined with thin bed mortar, using techniques identical to those used with standard concrete blocks. For additional strength, walls may be reinforced with steel or other structural members run vertically through spaces in the blocks. AAC concrete can be used for walls, floors, and roofs, and its light weight makes it more versatile than standard concrete. The material offers excellent sound and thermal insulation, and is strong and fire resistant. However, in order to be durable, AAC must be covered with an applied finish, such as polymer-modified stucco, natural or engineered stone, or siding. If used for basements, the outer face of AAC walls must be coated with a thick layer of waterproof material or membrane. AAC surfaces exposed to weather or soil moisture will break down. Interior surfaces can be finished with drywall, plaster, tile, or paint, or can be left exposed. Inherently, AAC offers only moderate insulation values—about R-10 for an 8-inch-thick wall and R-12.5 for a 10-inch-thick wall. AAC offers an R value of about 1.25 for each inch of material thickness. But AAC has a high thermal mass, which slows the transfer of thermal energy and can greatly reduce heating and cooling costs. And AAC structures can be made very airtight to reduce energy losses due to air leaks. AAC also creates an excellent soundproofing barrier. Products often show inconsistency in quality and color. Unfinished exterior walls require exterior cladding to protect them from weather. If installed in high humidity environments, interior finishes require low vapor permeability and exterior finishes require high permeability. R-values are relatively low when compared to energy-efficient insulated wall construction. Cost is higher than a conventional concrete block and wood-frame construction. Strength of AAC is 1/6 to 1/3 that of traditional concrete block. 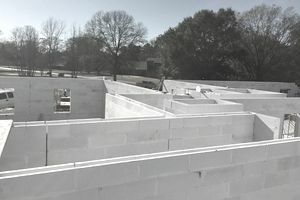 Basic AAC block in the standard size of 8 x 8 x 24 inches costs about $2.20 to $2.50 per square foot as of July 2018, slightly more than standard concrete block, which costs about $2.00 per square foot. However, labor costs for AAC can be lower because its lighter weight makes it easier to handle and install. Costs will vary from region to region and are affected by local labor rates and building code requirements. Learn the Advantages of Warm Mix Asphalt?